Last evening, I was having dinner at a terrace cafe in the Sultanahmet neighborhood of Istanbul, with a view of both Aya Sofya and the famous Blue Mosque lit up in rotating colors. 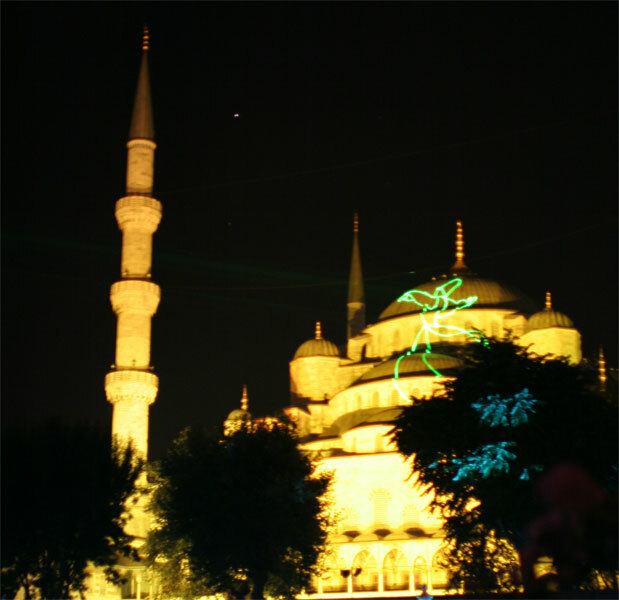 On the domes of the mosque, there was a laser light display of a whirling dervish. Visitors to Atlanta (my home for more than 13 years) may have seen the laser light show at Stone Mountain, which animates the confederate generals on the side of the largest chunk of free standing exposed granite in the world. And, after a series of cartoon-like animations set to music by bands like ZZ Top, the generals ride off into the sunset after the country is unified. I recall the final moments being set to the Battle Hymn of the Republic, sung by none other than Elvis, who died thirty years ago this week (and would have been 72). 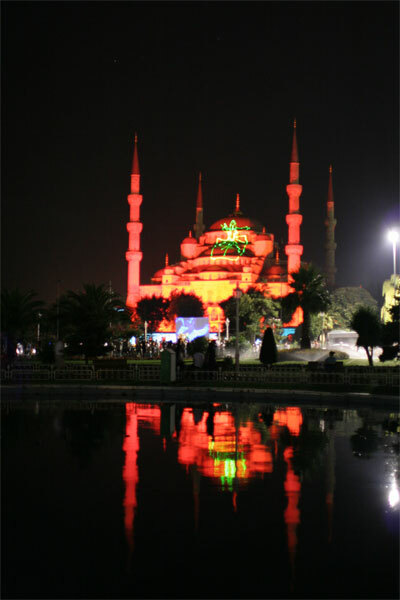 But this laser show featured a lone dervish, twirling on the dome, surrounded by colored lights on the domes, walls and minarets. And a film, describing the life of words of Jalal ad-Din Muhammad Rumi, the mystic and poet and founder of the Mevlevi sect of Sufi Islam, played on a screen in front of the mosque. Earlier yesterday, as I lifted my camera to take the first of what I had hoped would be several photos during a ferry ride up the Bosphorus to a small village near the Black Sea, I saw a terrible message on my camera’s LCD screen: “no cf card.” Argh. I left my compact flash memory card in the little reader I use to load images into my computer. It was in sitting on the desk in my little hotel room. So you’ll have to take my word for it that there were lovely scenes along the shores of the Bosphorus, the strait that connects the Black Sea with the Sea of Marmara. Little villas and towns line the shores, and it was about an a hour and a half to the last stop on the ferry ride. As soon as I got off at the dock, I saw a sign that said “castle this way.” I climbed the hill and walked about a mile to the top, where old castle walls look over the entrance to the Black Sea. On Monday night, while you were watching the laser dervish, I went to the Giza pyramids Sound & Light Show. It was every bit as lame as you might expect. The advice I’ve gotten about the sound and light shows in Egypt is to go on nights when it’s in Arabic. That way — if you don’t speak the language — you focus on the lights and not the sound, and you don’t realize how corny it really is.